1 A None No Power Seat 1 A is a Business Class seat which converts to a flat bed and is located at a bulkhead. If you are a solo traveler then this is a desirable seat due to its singularity and the dual side tables. The proximity to the galley and lavatory might be bothersome. A bassinet/baby basket is available at this seat. A passenger traveling with an infant might be seated here. 1 D None No Power Seat 1 D is a Business Class seat which converts to a flat bed and is located at a bulkhead. The proximity to the galley and lavatory might be bothersome. A bassinet/baby basket is available at this seat. A passenger traveling with an infant might be seated here. This seat and the one adjacent are ideal if traveling with a companion. 1 G None No Power Seat 1 G is a Business Class seat which converts to a flat bed and is located at a bulkhead. The proximity to the galley and lavatory might be bothersome. A bassinet/baby basket is available at this seat. A passenger traveling with an infant might be seated here. This seat and the one adjacent are ideal if traveling with a companion. 1 K None No Power Seat 1 K is a Business Class seat which converts to a flat bed and is located at a bulkhead. The proximity to the galley and lavatory might be bothersome. A bassinet/baby basket is available at this seat. A passenger traveling with an infant might be seated here. 10 A None No Power Seat 10 A is a standard Economy Max Class seat which offers 5 more inches of legroom than the standard Economy Class seat. 10 B None No Power Seat 10 B is a standard Economy Max Class seat which offers 5 more inches of legroom than the standard Economy Class seat. 10 D None No Power Seat 10 D is a standard Economy Max Class seat which offers 5 more inches of legroom than the standard Economy Class seat. 10 E None No Power Seat 10 E is a standard Economy Max Class seat which offers 5 more inches of legroom than the standard Economy Class seat. 10 F None No Power Seat 10 F is a standard Economy Max Class seat which offers 5 more inches of legroom than the standard Economy Class seat. 10 G None No Power Seat 10 G is a standard Economy Max Class seat which offers 5 more inches of legroom than the standard Economy Class seat. 10 J None No Power Seat 10 J is a standard Economy Max Class seat which offers 5 more inches of legroom than the standard Economy Class seat. 10 K None No Power Seat 10 K is a standard Economy Max Class seat which offers 5 more inches of legroom than the standard Economy Class seat. 11 A None No Power Seat 11 A is a standard Economy Max Class seat which offers 5 more inches of legroom than the standard Economy Class seat. 11 B None No Power Seat 11 B is a standard Economy Max Class seat which offers 5 more inches of legroom than the standard Economy Class seat. 11 D None No Power Seat 11 D is a standard Economy Max Class seat which offers 5 more inches of legroom than the standard Economy Class seat. 11 E None No Power Seat 11 E is a standard Economy Max Class seat which offers 5 more inches of legroom than the standard Economy Class seat. 11 F None No Power Seat 11 F is a standard Economy Max Class seat which offers 5 more inches of legroom than the standard Economy Class seat. 11 G None No Power Seat 11 G is a standard Economy Max Class seat which offers 5 more inches of legroom than the standard Economy Class seat. 11 J None No Power Seat 11 J is a standard Economy Max Class seat which offers 5 more inches of legroom than the standard Economy Class seat. 11 K None No Power Seat 11 K is a standard Economy Max Class seat which offers 5 more inches of legroom than the standard Economy Class seat. 12 A None No Power Seat 12 A is a standard Economy Max Class seat which offers 5 more inches of legroom than the standard Economy Class seat. 12 B None No Power Seat 12 B is a standard Economy Max Class seat which offers 5 more inches of legroom than the standard Economy Class seat. 12 D None No Power Seat 12 D is a standard Economy Max Class seat which offers 5 more inches of legroom than the standard Economy Class seat. 12 E None No Power Seat 12 E is a standard Economy Max Class seat which offers 5 more inches of legroom than the standard Economy Class seat. 12 F None No Power Seat 12 F is a standard Economy Max Class seat which offers 5 more inches of legroom than the standard Economy Class seat. 12 G None No Power Seat 12 G is a standard Economy Max Class seat which offers 5 more inches of legroom than the standard Economy Class seat. 12 J None No Power Seat 12 J is a standard Economy Max Class seat which offers 5 more inches of legroom than the standard Economy Class seat. 12 K None No Power Seat 12 K is a standard Economy Max Class seat which offers 5 more inches of legroom than the standard Economy Class seat. 14 A None No Power Seat 14 A is a standard Economy Max Class seat which offers 5 more inches of legroom than the standard Economy Class seat. 14 B None No Power Seat 14 B is a standard Economy Max Class seat which offers 5 more inches of legroom than the standard Economy Class seat. 14 D None No Power Seat 14 D is a standard Economy Max Class seat which offers 5 more inches of legroom than the standard Economy Class seat. 14 E None No Power Seat 14 E is a standard Economy Max Class seat which offers 5 more inches of legroom than the standard Economy Class seat. 14 F None No Power Seat 14 F is a standard Economy Max Class seat which offers 5 more inches of legroom than the standard Economy Class seat. 14 G None No Power Seat 14 G is a standard Economy Max Class seat which offers 5 more inches of legroom than the standard Economy Class seat. 14 J None No Power Seat 14 J is a standard Economy Max Class seat which offers 5 more inches of legroom than the standard Economy Class seat. 14 K None No Power Seat 14 K is a standard Economy Max Class seat which offers 5 more inches of legroom than the standard Economy Class seat. 2 A None No Power Seat 2 A is a Business Class seat which converts to a flat bed. This seat and the one adjacent are ideal if traveling with a companion. 2 B None No Power Seat 2 B is a Business Class seat which converts to a flat bed. This seat and the one adjacent are ideal if traveling with a companion. 2 D None No Power Seat 2 D is a Business Class seat which converts to a flat bed. This seat and the one adjacent are ideal if traveling with a companion. 2 G None No Power Seat 2 G is a Business Class seat which converts to a flat bed. This seat and the one adjacent are ideal if traveling with a companion. 2 K None No Power Seat 2 K is a Business Class seat which converts to a flat bed. 26 A None No Power Seat 26 A is a standard Economy Class seat. The proximity to the lavatory section might be bothersome. 26 B None No Power Seat 26 B is a standard Economy Class seat. The proximity to the lavatory section might be bothersome. 26 D None No Power Seat 26 D is a standard Economy Class seat. The proximity to the lavatory section might be bothersome. 26 E None No Power Seat 26 E is a standard Economy Class seat. The proximity to the lavatory section might be bothersome. 26 F None No Power Seat 26 F is a standard Economy Class seat. The proximity to the lavatory section might be bothersome. 26 G None No Power Seat 26 G is a standard Economy Class seat. The proximity to the lavatory section might be bothersome. 26 J None No Power Seat 26 J is a standard Economy Class seat. The proximity to the lavatory section might be bothersome. 26 K None No Power Seat 26 K is a standard Economy Class seat. The proximity to the lavatory section might be bothersome. 27 D None No Power Seat 27 D is a standard Economy Class seat located at an Exit Row. There is additional legroom at this location. There is no floor storage for use during takeoff and landing. The tray table and the IFE monitor are placed in the armrest making the armrest immovable and slightly reducing seat width. The proximity to the lavatory section might be bothersome. A bassinet/baby basket is available in this row, therefore, passenger traveling with an infant might be seated here. 27 E None No Power Seat 27 E is a standard Economy Class seat located at an Exit Row. There is additional legroom at this location. There is no floor storage for use during takeoff and landing. The tray table and the IFE monitor are placed in the armrest making the armrest immovable and slightly reducing seat width. The proximity to the lavatory section might be bothersome. A bassinet/baby basket is available in this row, therefore, passenger traveling with an infant might be seated here. 27 F None No Power Seat 27 F is a standard Economy Class seat located at an Exit Row. There is additional legroom at this location. There is no floor storage for use during takeoff and landing. The tray table and the IFE monitor are placed in the armrest making the armrest immovable and slightly reducing seat width. The proximity to the lavatory section might be bothersome. A bassinet/baby basket is available in this row, therefore, passenger traveling with an infant might be seated here. 27 G None No Power Seat 27 G is a standard Economy Class seat located at an Exit Row. There is additional legroom at this location. There is no floor storage for use during takeoff and landing. The tray table and the IFE monitor are placed in the armrest making the armrest immovable and slightly reducing seat width. The proximity to the lavatory section might be bothersome. A bassinet/baby basket is available in this row, therefore, passenger traveling with an infant might be seated here. 28 A None No Power Seat 28 A is a standard Economy Class seat located at an Exit Row. There is additional legroom at this location. The tray table and the IFE monitor are placed in the armrest making the armrest immovable and slightly reducing seat width. There is no floor storage for use during takeoff and landing. The proximity to the lavatory section might be bothersome. 28 B None No Power Seat 28 B is a standard Economy Class seat located at an Exit Row. There is additional legroom at this location. The tray table and the IFE monitor are placed in the armrest making the armrest immovable and slightly reducing seat width. There is no floor storage for use during takeoff and landing. The proximity to the lavatory section might be bothersome. 28 J None No Power Seat 28 J is a standard Economy Class seat located at an Exit Row. There is additional legroom at this location. The tray table and the IFE monitor are placed in the armrest making the armrest immovable and slightly reducing seat width. There is no floor storage for use during takeoff and landing. The proximity to the lavatory section might be bothersome. 28 K None No Power Seat 28 K is a standard Economy Class seat located at an Exit Row. There is additional legroom at this location. The tray table and the IFE monitor are placed in the armrest making the armrest immovable and slightly reducing seat width. There is no floor storage for use during takeoff and landing. The proximity to the lavatory section might be bothersome. 3 A None No Power Seat 3 A is a Business Class seat which converts to a flat bed. If you are a solo traveler then this is one of the most desirable seats in Business Class due to its singularity and the dual side tables. 3 D None No Power Seat 3 D is a Business Class seat which converts to a flat bed. This seat and the one adjacent are ideal if traveling with a companion. 3 G None No Power Seat 3 G is a Business Class seat which converts to a flat bed. This seat and the one adjacent are ideal if traveling with a companion. 3 K None No Power Seat 3 K is a Business Class seat which converts to a flat bed. 4 A None No Power Seat 4 A is a Business Class seat which converts to a flat bed. This seat and the one adjacent are ideal if traveling with a companion. 4 B None No Power Seat 4 B is a Business Class seat which converts to a flat bed. This seat and the one adjacent are ideal if traveling with a companion. 4 D None No Power Seat 4 D is a Business Class seat which converts to a flat bed. This seat and the one adjacent are ideal if traveling with a companion. 4 G None No Power Seat 4 G is a Business Class seat which converts to a flat bed. This seat and the one adjacent are ideal if traveling with a companion. 4 K None No Power Seat 4 K is a Business Class seat which converts to a flat bed. 44 A None No Power Seat 44 A is a standard Economy Class seat located in the last row of the aircraft. Seat back recline might be limited. The proximity to the galley might be bothersome. 44 B None No Power Seat 44 B is a standard Economy Class seat located in the last row of the aircraft. Seat back recline might be limited. The proximity to the galley might be bothersome. 44 D None No Power Seat 44 D is a standard Economy Class seat located in the last row of the aircraft. Seat back recline might be limited. The proximity to the galley might be bothersome. 44 E None No Power Seat 44 E is a standard Economy Class seat located in the last row of the aircraft. Seat back recline might be limited. The proximity to the galley might be bothersome. 44 G None No Power Seat 44 G is a standard Economy Class seat located in the last row of the aircraft. Seat back recline might be limited. The proximity to the galley might be bothersome. 44 J None No Power Seat 44 J is a standard Economy Class seat located in the last row of the aircraft. Seat back recline might be limited. The proximity to the galley might be bothersome. 44 K None No Power Seat 44 K is a standard Economy Class seat located in the last row of the aircraft. Seat back recline might be limited. The proximity to the galley might be bothersome. 5 A None No Power Seat 5 A is a Business Class seat which converts to a flat bed. If you are a solo traveler then this is one of the most desirable seats in Business Class due to its singularity and the dual side tables. 5 D None No Power Seat 5 D is a Business Class seat which converts to a flat bed. This seat and the one adjacent are ideal if traveling with a companion. 5 G None No Power Seat 5 G is a Business Class seat which converts to a flat bed. This seat and the one adjacent are ideal if traveling with a companion. 5 K None No Power Seat 5 K is a Business Class seat which converts to a flat bed. 6 A None No Power Seat 6 A is a Business Class seat which converts to a flat bed. This seat and the one adjacent are ideal if traveling with a companion. The proximity to the galley and lavatory might be bothersome. 6 B None No Power Seat 6 B is a Business Class seat which converts to a flat bed. This seat and the one adjacent are ideal if traveling with a companion. The proximity to the galley and lavatory might be bothersome. 6 D None No Power Seat 6 D is a Business Class seat which converts to a flat bed. This seat and the one adjacent are ideal if traveling with a companion. The proximity to the galley and lavatory might be bothersome. 6 G None No Power Seat 6 G is a Business Class seat which converts to a flat bed. This seat and the one adjacent are ideal if traveling with a companion. The proximity to the galley and lavatory might be bothersome. 6 K None No Power Seat 6 K is a Business Class seat which converts to a flat bed. The proximity to the galley and lavatory might be bothersome. 7 A None No Power Seat 7 A is a standard Economy Max Class seat which offers 5 more inches of legroom than the standard Economy Class seat. This seat is located at a bulkhead. The tray table and the IFE monitor are placed in the armrest making the armrest immovable and slightly reducing seat width. The proximity to the galley and lavatory might be bothersome. There is no floor storage available for use during takeoff and landing. 7 B None No Power Seat 7 B is a standard Economy Max Class seat which offers 5 more inches of legroom than the standard Economy Class seat. This seat is located at a bulkhead. The tray table and the IFE monitor are placed in the armrest making the armrest immovable and slightly reducing seat width. The proximity to the galley and lavatory might be bothersome. There is no floor storage available for use during takeoff and landing. 7 D None No Power Seat 7 D is a standard Economy Max Class seat which offers 5 more inches of legroom than the standard Economy Class seat. This seat is located at a bulkhead. The tray table and the IFE monitor are placed in the armrest making the armrest immovable and slightly reducing seat width. The proximity to the galley and lavatory might be bothersome. There is no floor storage available for use during takeoff and landing. A bassinet/baby basket is available in this row, therefore, a passenger traveling with an infant might be seated here. 7 E None No Power Seat 7 E is a standard Economy Max Class seat which offers 5 more inches of legroom than the standard Economy Class seat. This seat is located at a bulkhead. The tray table and the IFE monitor are placed in the armrest making the armrest immovable and slightly reducing seat width. The proximity to the galley and lavatory might be bothersome. There is no floor storage available for use during takeoff and landing. A bassinet/baby basket is available in this row, therefore, a passenger traveling with an infant might be seated here. 7 F None No Power Seat 7 F is a standard Economy Max Class seat which offers 5 more inches of legroom than the standard Economy Class seat. This seat is located at a bulkhead. The tray table and the IFE monitor are placed in the armrest making the armrest immovable and slightly reducing seat width. The proximity to the galley and lavatory might be bothersome. There is no floor storage available for use during takeoff and landing. A bassinet/baby basket is available in this row, therefore, a passenger traveling with an infant might be seated here. 7 G None No Power Seat 7 G is a standard Economy Max Class seat which offers 5 more inches of legroom than the standard Economy Class seat. This seat is located at a bulkhead. The tray table and the IFE monitor are placed in the armrest making the armrest immovable and slightly reducing seat width. The proximity to the galley and lavatory might be bothersome. There is no floor storage available for use during takeoff and landing. A bassinet/baby basket is available in this row, therefore, a passenger traveling with an infant might be seated here. 7 J None No Power Seat 7 J is a standard Economy Max Class seat which offers 5 more inches of legroom than the standard Economy Class seat. This seat is located at a bulkhead. The tray table and the IFE monitor are placed in the armrest making the armrest immovable and slightly reducing seat width. The proximity to the galley and lavatory might be bothersome. There is no floor storage available for use during takeoff and landing. 7 K None No Power Seat 7 K is a standard Economy Max Class seat which offers 5 more inches of legroom than the standard Economy Class seat. This seat is located at a bulkhead. The tray table and the IFE monitor are placed in the armrest making the armrest immovable and slightly reducing seat width. The proximity to the galley and lavatory might be bothersome. There is no floor storage available for use during takeoff and landing. 9 A None No Power Seat 9 A is a standard Economy Max Class seat which offers 5 more inches of legroom than the standard Economy Class seat. 9 B None No Power Seat 9 B is a standard Economy Max Class seat which offers 5 more inches of legroom than the standard Economy Class seat. 9 D None No Power Seat 9 D is a standard Economy Max Class seat which offers 5 more inches of legroom than the standard Economy Class seat. 9 G None No Power Seat 9 G is a standard Economy Max Class seat which offers 5 more inches of legroom than the standard Economy Class seat. 9 J None No Power Seat 9 J is a standard Economy Max Class seat which offers 5 more inches of legroom than the standard Economy Class seat. 9 K None No Power Seat 9 K is a standard Economy Max Class seat which offers 5 more inches of legroom than the standard Economy Class seat. Power is available onboard Edelweiss Air's A330 aircraft. AC power and USB ports are available at every seat in Business Class. USB ports are available at every seat in Economy and Economy Max Classes. 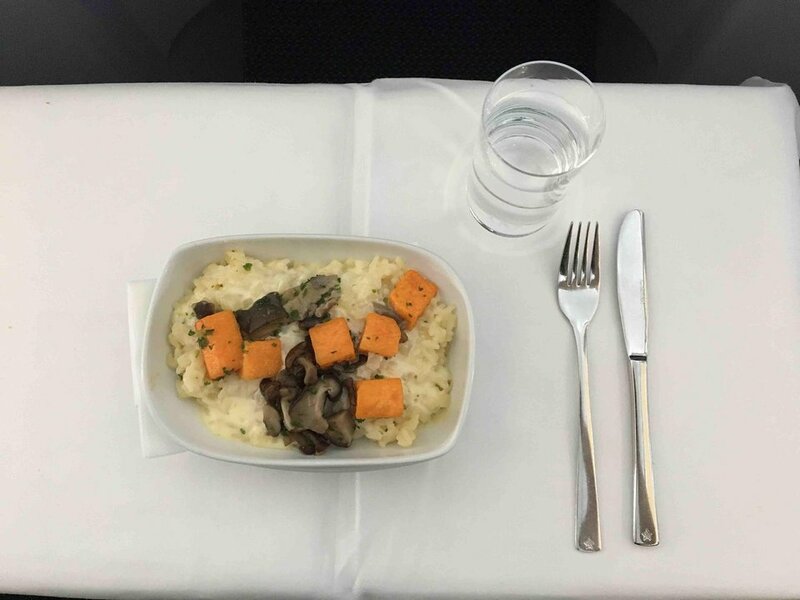 Edelweiss Air provides full-course meals and an assortment of beverages in all classes on their A330 aircraft on long-haul flights. Edelweiss Air Airbus A330 aircraft are used on long-haul flights. The aircraft feature Business Class seats, each may be converted to a flat bed arrangement, standard Economy Class seating, and Economy Max seating which offers 15 centimeters/5 inches additional legroom. Gute Sitze in der Business-Klasse. Flaches Bett 200 cm. Da die Mittelkonsole breit ist, etwas wenig Platz im Bereich der Schultern. Sitze haben Massagefunktion. Klasse Service und sehr gutes Essen. Wurden verwöhnt. Good seats in the business class. Flat bed 200 cm. As the center console is wide, there is little space around the shoulders. Seats have massage function. Great service and very good food. Were spoiled. Economy Max seats come with a small amenity kit and alcohol is included. I was able to upgrade from economy to economy max for free at the counter check in in Denver (from 15k to 14k). Seat was comfortable for an economy seat, food was good, drink selections were good. Width is ok, legroom not. Very small for larger human beeings. Edelweiss Air flies 1 versions of Airbus A330-300.